And that’s as it should be. If only everyone in public service told it as they see it. 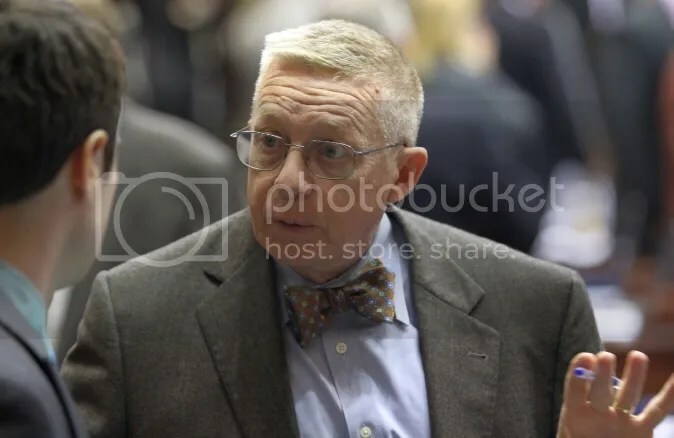 Representative Chris Kelly (D) on the floor of the House [file photo]. His point that day, Kelly said, was that legislation would not stop abortions, only drive them underground. “To make that point, I brought out the coat hanger,” he said…. 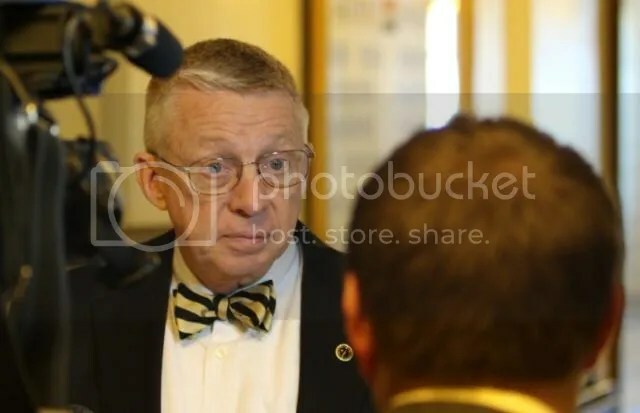 Representative Chris Kelly (D) – media interview in a Capitol hallway [file photo]. Legislators in the “Show Me State” are trying to sneak through legislation banning the electric car company from selling directly to consumers. ….Missouri is the latest state to try to slip in anti-Tesla legislation without anyone noticing. 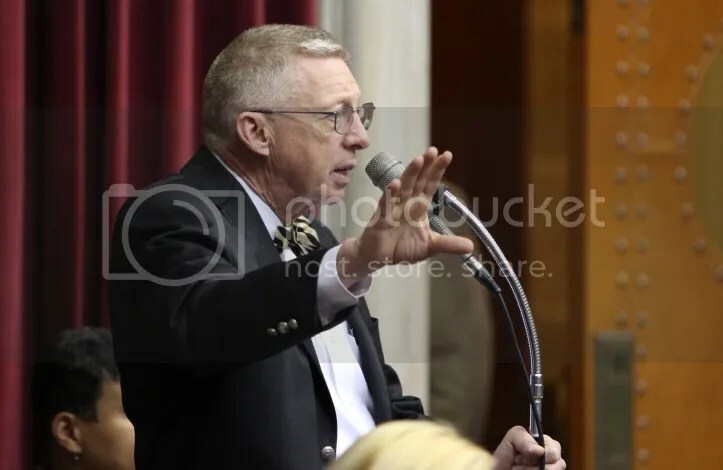 The “Show Me State” legislature is trying to obscure their actions by slipping through legislation as it current session comes to an end this Spring. Just this week, the state’s auto dealers proposed new language in an existing bill that would force consumers to buy new cars and trucks only through franchised dealerships. 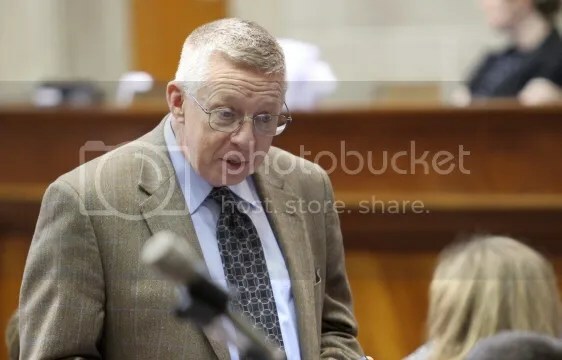 The bill, HB 1124, has been in bouncing around since late last year, and was passed by the state’s House in mid April without containing any anti-Tesla language. But this week, the bill reemerged with the new language aimed to stop Tesla from selling cars. This Senate version passed with no public consultation whatsoever, and will likely move to the House floor for a final vote, essentially without debate. This change to the bill is not just a minor amendment, it has morphed into a bill that is completely unrelated to the original one, which related only to sales for off-road and all-terrain vehicles and barred the manufacturers from competing against their franchisees (for example, Ford Motor Company cannot compete against Ford dealerships). Tesla, which doesn’t have franchisees or a dealership network, would not have been effected by the original bill. The amendment also attempts to redefine the word “franchisor” to mean “manufacturer”, a slick change of legal wording of which legislators may not even be aware. This goes beyond automotive dealers trying to protect their existing monopolies – this legislation seeks to create a new car-sales monopoly…. To repeal sections 301.010, 301.227, 301.700, 302.020, 407.815, 407.826, and 578.120, RSMo, and to enact in lieu thereof eight new sections relating to motor vehicles, with existing penalty provisions. 2. A franchisor shall not sell new motor vehicles directly to any retail consumer except through a franchisee for the line-make that includes the new motor vehicle unless such consumer is an employee of the franchisor, or is a not-for-profit organization or an agency of the federal, state or local governments. This subsection shall not preclude a franchisor from providing information to consumers for the purpose of marketing or facilitating the sale of a new motor vehicle or from establishing programs to sell or offer to sell new motor vehicles through participating franchisees. The House was working to approve the conference bills on the state budget today. 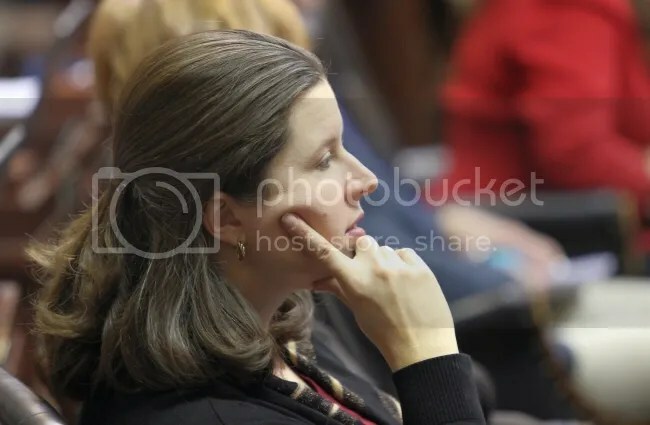 Representative Chris Kelly (D) on the floor of the House during debate on a budget bill – May 8, 2014. If Representative Kelly ever wants a place to hang out after he leaves the General Assembly he’s most welcome here. He’d fit right in. 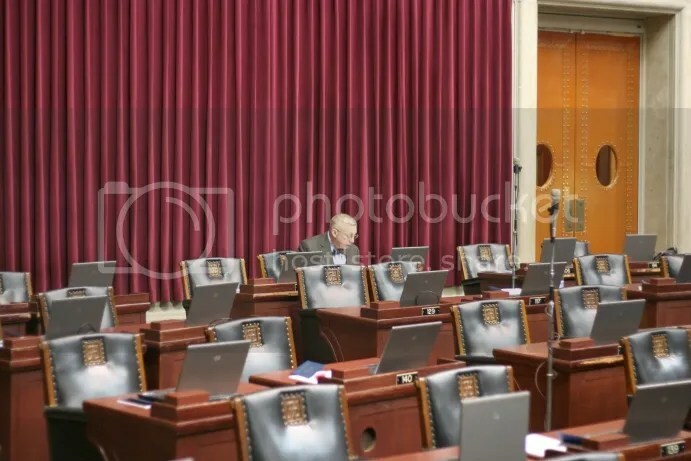 Republicans in the Missouri Legislature, having performed their annual tax-cut pageant for extremist political donors, can now relax and wait for Gov. Jay Nixon to take them off the hook. There may be a few members of the GOP who actually believe the fairy tale that cutting taxes by anywhere from $620 million to $800 million a year will plant magic beans that make the economy grow by more than that amount. We’d like to think that most of them are not simpletons. They’ve seen the disaster that befell Kansas when it climbed the beanstalk. They realize that if a low tax burden were all it took to boost a state’s economy, Missouri would be thriving. The state already seriously underfunds education, infrastructure and social services. 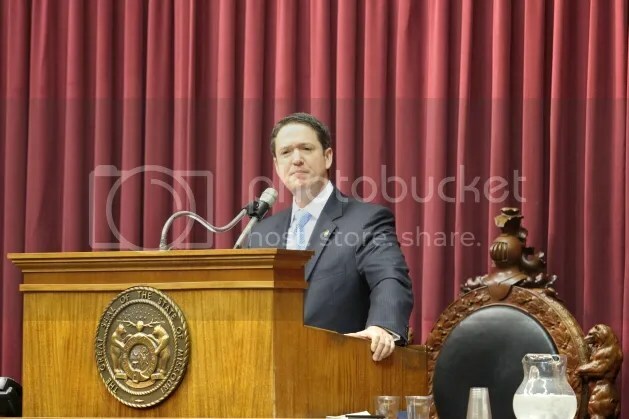 Missourians cannot afford Senate Bill 509, not unless they yearn to live in Mississippi North…. The Glorious Chamber of People’s Deputies wants us all to believe. If by “people” you mean subchapter S corporations, partnerships and limited liability corporations. The second regular session of the 97th General Assembly commenced at noon today in Jefferson City. 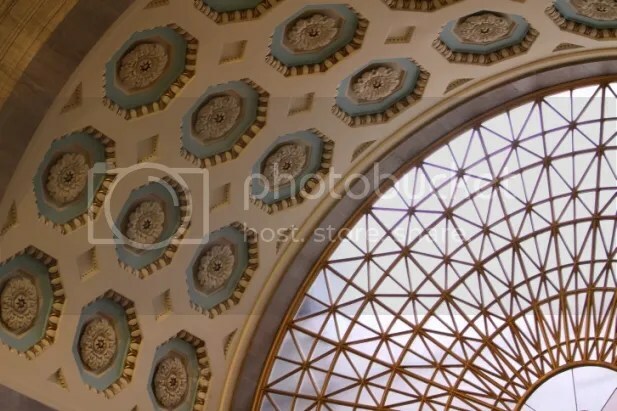 Architectural detail in the Missouri capitol building. Expectations for any legislative accomplishment or any significant bipartisan agreement during this session have already been low. Representative Chris Kelly (D) – the first member on the floor before the start of the session. Speaker Timothy Jones (r) partisan remarks to the House pretty much insured that there’s not going to be any progress on legislation on a number of issues. Medicaid anyone? 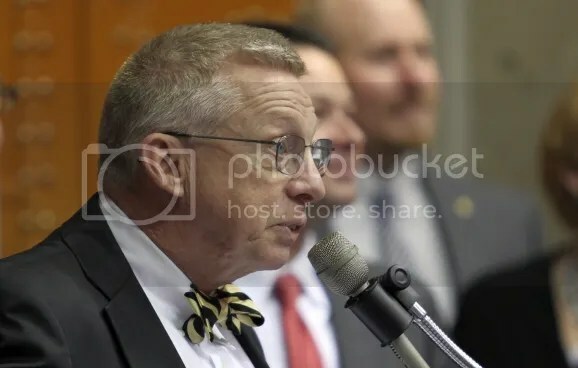 Speaker Timothy Jones (r) addressing the House. 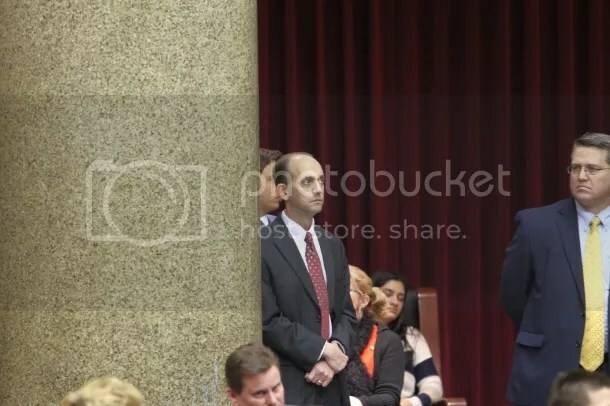 State Auditor Tom Schweich (r) watches the proceedings in the House from a side gallery. “The welfare of the people shall be the supreme law” – noble sentiment, rarely accomplished. And definitely not in this session of the General Assembly. The mood throughout the day could only be described as subdued. 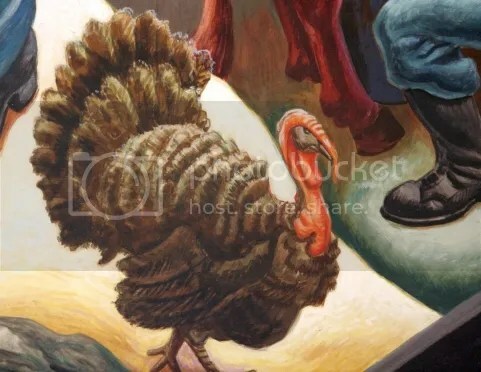 A detail from the Thomas Hart Benton painting in the House Lounge. The most important issue facing the 2014 Missouri Legislature is whether to expand state health care coverage to working people who earn up to 138% of the federal poverty level. 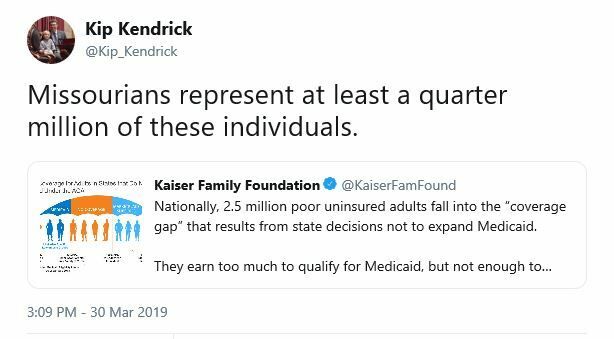 I say “working people” because the vast majority of the 226,525 uninsured Missourians who fall between 19% of the federal poverty level–the current limit for Medicaid coverage in Missouri–and 138% are employed at low wage jobs. The Affordable Care Act (ACA) provides that, if states extend Medicaid coverage to include those uninsured in this population, the federal government will pay 100% of the Medicaid cost through 2016, then gradually decrease to 90% in 2020 and beyond. Originally the ACA made Medicaid expansion mandatory. The additional money that would have come to states to cover uninsured people would also have replaced current federal payments to hospitals, primarily subsidized payments for uncompensated care. 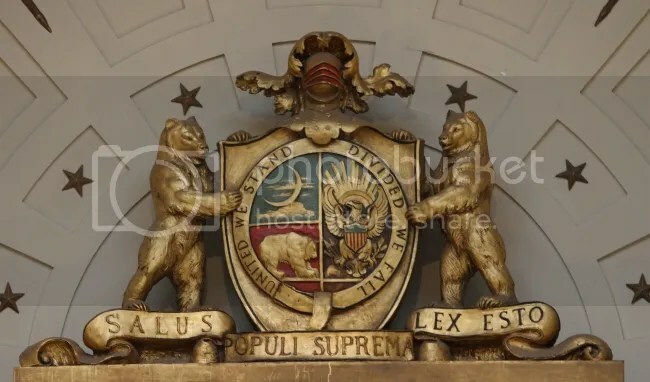 The United States Supreme Court ruled that the ACA itself (with its individual mandate) is constitutional but Congress could not force states to expand Medicaid eligibility. The negative financial consequence of this decision was negligible in states that chose to expand Medicaid to cover the working poor, but devastating to hospitals in states like Missouri, which, thus far, have refused to accept federal money. Missouri’s hospitals will lose federal uncompensated care subsidies and, without state Medicaid expansion, will see no increase in Medicaid reimbursement. This revenue shortfall will have a tragic economic effect on rural hospitals throughout Missouri. These institutions are often the economic anchors of their communities. In my own community of Columbia, the failure of the state legislature to act will cost Columbia’s hospitals about $30 million. Our hospitals will be hurt, but will survive. The same cannot be said for many smaller, rural institutions. Our state legislature must do everything in its power to strengthen rather than weaken Missouri’s rural hospitals. 1. The cost to our hospitals and ultimately to our economy of not expanding Missouri health care coverage will be $3.5 billion by 2019. 2. Expansion would have a direct positive effect on the state General Revenue budget of at least $40 million per year, not including any positive effect resulting from increased secondary economic activity. 3. The St. Louis Regional Chamber of Commerce (RCGA) forecasts that the ten-year impact of not expanding coverage will be equivalent to eliminating more than 5,000 jobs. 4. Expanding Medicaid in Missouri will result in an additional 20,000 jobs and increase employment income by more than $5 billion. (RCGA) Many of these new jobs will be in south and southeastern Missouri, an area of our state where poverty is greater and hospitals are most threatened. Although opponents have never presented any objective analysis to rebut that of the business community, many suggest that somehow expansion will cost our General Revenue money and ultimately erode support for education. I have the privilege of serving on the House Interim Committee on Medicaid Transformation. One of the things we have learned is that if one objectively evaluates all the costs and benefits of expansion, the inescapable conclusion is that expansion actually saves money in the General Revenue Budget. For example, today the state pays 100% of the medical cost of prisoners. If we were to expand coverage, the federal government would pay 100% of the cost for prisoners who are admitted to hospitals. That number averages about 150 hospital nights per month. Many similar efficiencies exist. The bottom line is that expansion makes more, not less, General Revenue available for education. If opponents disagree they have an obligation to present the facts to support their supposition. I have not addressed any of the human issues: Is it better for working people and their children to have health care? Is it better to treat with preventative care rather than emergency room care? Even if one’s analysis is completely economic and ignores all of the human issues, healthcare transformation is vital for the well being of our state. I encourage you to speak with your state legislator about this issue. 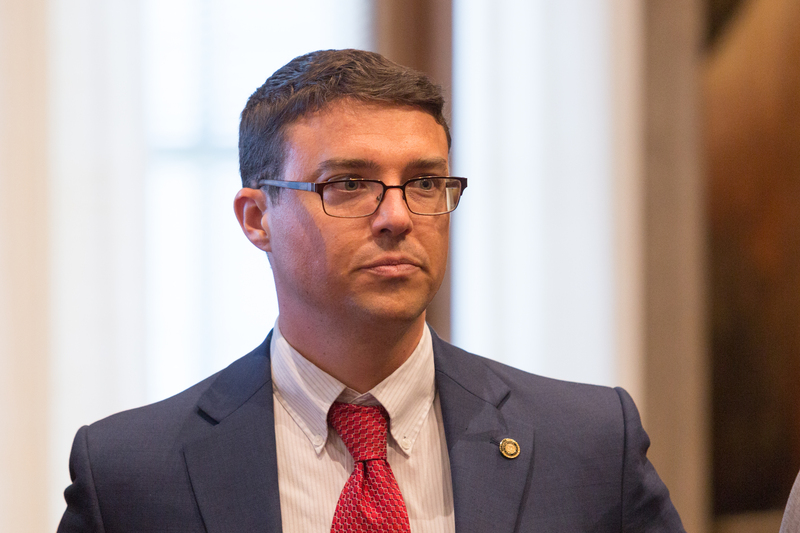 HB253 is the first opportunity in nearly 100 years to reduce taxes for all Missourians – and take a stand on the side of every day Missourians who have weathered the storm of this economic recession instead of special interests and government bureaucrats who only wish to serve their own interests. 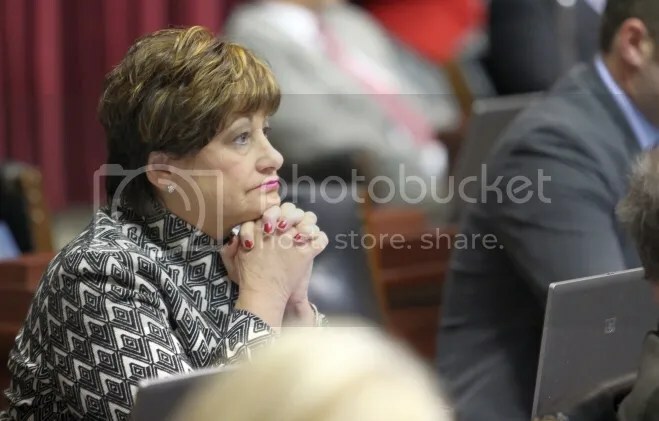 Perhaps more importantly, HB253 would allow Missouri to stop spending and start growing by directing an increase in state revenues back to taxpayers instead of into expanding the size of government that promotes greater waste. I urge you to support HB253 during the upcoming veto session. Thank you for the letter regarding HB 253. The bill is significant to me not simply as a state rep but also as a taxpayer. I am 66 years old and had a heart attack this past May. I now take six different pre[s]cription medications. 253 imposes the state sales tax on that medicine. My pharmacist calculated that if the veto override, which you support is successful I will pay about $140 per year in sales tax; significantly more than any benefit from the income tax decrease. I am not alone. In fact I am probably paying less for medicine than most people in my demographic (geezers). The bill also imposes the sales tax on college text books. In addition, the bill allows income tax payers to go back three years to file amended returns and receive more refunds. The sponsors claim that this is a “mistake”. They now say that the prescription medicine tax is a mistake. If anyone in the private sector made those kind of mistakes they would be fired. That amounts to about half a billion dollars worth of “mistakes”. It turns out that all the “mistakes” are things wanted by Rex Sin[que]field, the guy who made more than $1.5 million in campaign contributions to the supporters of the bill. This is one of the sloppiest bills I have seen in my 17 years in the House. It is a disgrace that any legislator would allow it to move forward, if for no other reason than its quality. The truth is that you are being used by a small group of very self interested people. When, in the future, you read about the manipulation of the government by a few super rich people at the expense of average citizens remember that you actively participated in just such a scheme when you sent this letter. The very wealthy will see a huge benefit and average people will pay the tab. Every supporter of [HB]253 should be ashamed. A further note. The letter you sent me is a form written by the media people who are funding the political campaign for [HB] 253. I’d like to know what your opinion is. And that’s how you deal with astroturf. The costs and benefits of expansion have been analyzed in three separate studies: one by the Missouri Office of Budget and Planning, one by the Kaiser Foundation, and one by the University of Missouri Medical School in cooperation with Dobson, DaVanzo & Associates. The MU study is the most conservative, so I will rely upon it. The projected economic benefits and the number of Missourians covered by the expansion are substantially higher in the other two studies. The Federal Affordable Care Act (ACA, also known as Obamacare) allows states to expand their medical coverage to 138% of FPL. The Federal government will pay 100% of the cost through 2016. That percentage will phase down to 90% in 2020. About 161,000 additional Missourians would receive medical coverage under the expansion. Absent expansion, those Missourians will continue to live without health insurance. When they experience health problems, they show up at hospitals and are treated–but the cost of that care is not completely compensated. We all pay the cost of their treatment. It is redistributed through increases in our health care premiums or absorbed by the hospitals as uncompensated care. There is a provision in law whereby hospitals receive money to offset the cost of uncompensated care (called DSH or Disproportionate Share Hospital allotments). The DSH provision will be substantially reduced. It has been replaced by the option for states to expand coverage. That means that Missouri hospitals will lose DSH payments and, if there is no expansion of Medicaid coverage, they will also absorb the cost of treating people with no insurance–a huge financial burden. Statewide, the cost of decreased DSH payments will be roughly a half billion dollars. Losses to hospitals resulting from other changes in law will be about $2.6 billion. On the other hand, if Missouri expands coverage, the State will receive an additional $8.2 billion from the Federal Government in the years between 2014 and 2020. The state will be required to pay about $333 million, all occurring after 2017. The economic expansion would include an additional 24,000 new jobs with a payroll of nearly $7 billion and a total impact on Missouri’s economy of more than $16 billion. Tax revenues to the State would increase by more than $850 million. The tax revenue from the increased jobs and economic activity will generate more than double the cost of expansion. Viewing the loss of DSH payments at a local level, Christian Hospital in St Louis County will lose about $30M dollars. The combined losses to Boone Hospital and the University of Missouri in Columbia will be about $28M. Proportional losses will occur to hospitals in Springfield, Kansas City, St Joseph, Cape Girardeau and Joplin. The pattern is the same for all larger hospitals. They will be seriously harmed, but will survive. Having grown up in a rural community with a small hospital, I wondered what was likely to happen in rural Missouri. I studied the probable result of expansion of Medicaid verses non-expansion in West Plains, Missouri as an example. Ozarks Medical Center (OMC) is a 114-bed hospital, serving eleven counties and about 160,000 people. The closest large hospital is in Springfield, 100 miles away. OMC will lose about $2,225,000 as a result of the reduction of the DSH provision. OMC will still be required to treat all who appear at its door. In the event that those patients do not have insurance, OMC will not be fully compensated for that care. The hospital estimates that cost next year to be approximately $6-8 million. On the other hand, if the State were to expand Medicaid coverage, more than 9,000 additional people would have medical insurance in the West Plains service area. In addition to the benefits of medical insurance for those patients, the entire South Central Region will experience an economic benefit. The Federal contribution in the region is estimated to be $463M. More than a thousand jobs would be created. The total economic benefit to the region would be almost $800M. Much of this expansion would occur in Howell County. More patients mean more pharmacists, more nurses, more physical therapists, etc. OMC is larger and stronger than some other rural hospitals. As one looks east toward the Bootheel, the situation becomes more troubling. The hospitals are smaller and their patient populations are poorer. If Missouri does not expand coverage, Missouri could lose more than a dozen rural hospitals–perhaps as many as twenty-five–a tragedy for rural Missouri. I recently heard a story that illustrates the importance of these institutions to their communities. In 2007 a devastating tornado destroyed the entire town of Greensburg, Kansas. The people had to decide whether to rebuild. Many said, if the hospital rebuilds, we will too. Rural hospitals are often the economic nuclei of their communities. Their loss would in some cases mean that their communities would lose the critical mass necessary to stay economically viable. There is only one rational conclusion: Missouri will gain far more than it loses from the expansion of health care coverage. Opponents of expansion say, “We cannot afford it,” but these claims are simply an expression of opposition to the concept of “Obamacare” without analysis of the actual economic costs and benefits. Whether one supports or opposes the underlying philosophy of Obamacare, it is the law of the land. Missouri should not undermine the solvency of its own hospitals and decimate the economic lifeblood of many rural communities just for the sake of demonstrating political purity. The Legislature has an obligation to examine what is economically best for the State of Missouri. We should work together to find a solution we can all live with.